In this section we will present information on various sites or locations where stories, incidents, or events in the Canon took place. We will tell you a little about how the particular place was involved with Sherlock Holmes and his adventures, and what it was like there during the Holmes era. We will also present a little local history and maybe some interesting additional information about the location and its surroundings. Then we will take a look at the location and see how things are in the present day. 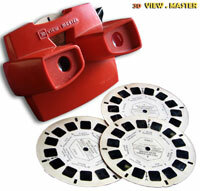 Viewmaster - See the sights! We hope to do about one per week, more or less. Coming first, for no logical reason, Margate.